Mr Netanyahu has presented the bill as a necessary response to the recent actions of three MPs from the Balad faction of the Joint List, a coalition of parties representing the often-overlooked fifth of Israel’s citizens who are Palestinian. He claims the MPs “sided with terror” this month when they visited Palestinian families in occupied East Jerusalem who have been waiting many months for Israel to return their relatives’ bodies. There is an urgent moral and political issue about Israel using bodies as bargaining chips to encourage Palestinian obedience towards its illegal occupation. The three Palestinian MPs also believe they are under an obligation to help the families by adding to the pressure on Mr Netanyahu to return the bodies. When a video of the meeting was posted online, however, the Israeli right seized the chance to attack and disenfranchise the MPs. A parliamentary “ethics” committee comprising the main Jewish parties suspended the three MPs for several months. Now they face losing their seats. This is part of a clear trend. Late last year, the government outlawed the northern Islamic Movement, a popular extra-parliamentary political, religious and welfare organisation. Despite Mr Netanyahu’s statements that the movement was linked to “terror”, leaks to the Israeli media showed his intelligence chiefs had advised him weeks before the ban that there was no evidence to support such accusations. At the time many Palestinians in Israel suspected Mr Netanyahu would soon turn his sights on the Palestinian parties in the parliament. And so he has. Balad, which decries Israel’s status as a Jewish state and noisily campaigns for democratic reform, was always likely to be top of his list. In every recent general election, an election committee dominated by the Jewish parties has banned Balad or its leaders from standing, only to see the Israeli courts reverse the decision. Now Mr Netanyahu is legislating the expulsion of Balad and throwing down the gauntlet to the courts. Mr Netanyahu, who had hoped to see the back of the Palestinian parties at last year’s general election, inadvertently transformed them into the third biggest party. That was the context for his now-infamous campaign warning that “the Arabs are coming out in droves to vote”. The crackdown on Palestinian parties may finally burst the simplistic assumption that Israel is a democracy because its Palestinian minority has the vote. In exiling more than 80 per cent of Palestinians from their homeland, Israel effectively rigged its national electoral constituency to ensure there would be a huge Jewish majority in perpetuity. A Palestinian MP, Ahmed Tibi, summed it up neatly. 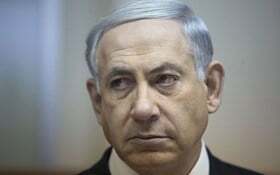 Israel, he said, was a democratic state for Jews and a Jewish state for its Palestinian citizens. He miscalculated. The Palestinian minority had a far higher birth rate and maintained a level of 20 per cent of the population. None of that would matter had the Palestinian representatives quietly accepted their position as shop-window mannequins. But in recent years, as Mahmoud Abbas’s Palestinian Authority has grown ever weaker, confined to small enclaves of the West Bank, the Palestinian MPs in Israel have taken up some of the slack. That was why the Balad MPs met the Jerusalem families. The PA, barred by Israel from East Jerusalem, can only look on helplessly on this issue.